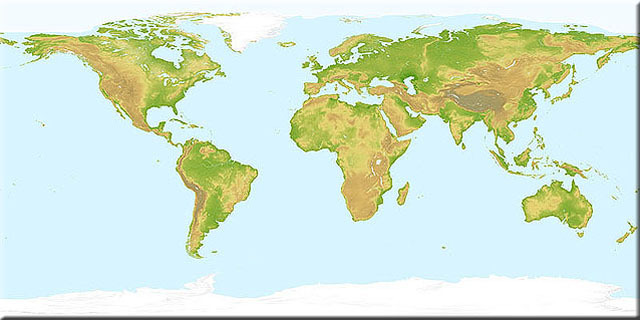 Our worldwide Land Topography texture map is coloured-by-height and hill-shaded in a traditional topographic colour scheme. With a pixel size of 1km, large sand dunes can be seen in the Sahara, Arabian and Gobi Deserts. Optional overlay layers show rivers, lakes and areas of permanent snow and ice cover. Our unique rivers layer shows rivers tapering in strength along their length based on hydrological analysis of their drainage area. Texture maps at a pixel size of 100 metres can be produced to order for any location between 60 degrees North and South, based on the most detailed publicly-available digital terrain data (SRTM3). Click here for more information about our improvements to this spaceborne radar-derived source data.